How can you use digital technology to manage your scribblings – and what will become of scribblings in the digital age? Kurt Vonnegut, prisoner of war and survivor of the Dresden bombing, wrote some of the most singular and humane fiction of the last century. Towards the end of his life, some schoolchildren wrote to invite him to speak to their class and reflect on what he had learned. He wrote back with all the wisdom anyone probably needs: “Dear Xavier high school, you really know how to cheer up a really old geezer (84) in his sunset years. I don’t make many appearances any more because I look like an iguana. Although my digitisation journeys continue to give me a great deal of satisfaction, I do look forward to the opportunities that arise to be a bit more artistic and creative. So, I’ve enjoyed the last three or four days spent trying to make something out of my doodle collection. The material seemed to fall into three categories – people (or maybe alien) figures, objects (such as trees, birds etc. ), and patterns; and I decided that I would try to assemble the figures as though they were having a group photo taken surrounded by the objects, and that I would use the patterns as the frame for the display. The material was all on rectangular notepad sheets so the first thing I did was to cut around the figure and object doodles and discard the blank paper. This exercise brought it home to me how many items there were and made me realise that I was going to need a big space to mount them on. After thinking about it for a while I decided to use the red brick back wall of the garage as my canvas. To stick the doodles to the wall, I used a roll of double sided selatape which I had acquired many years ago and which I’d been keeping for ‘when I might need it’ – it’s always satisfying to find a use for such things! I started off by assuming I would need a space of about 130 x 100cm and ended up with a picture, including frame, of about 180 x 130cm. Within that space, I managed to include nearly all the figures and objects – but the frame only used up a proportion of the patterns. 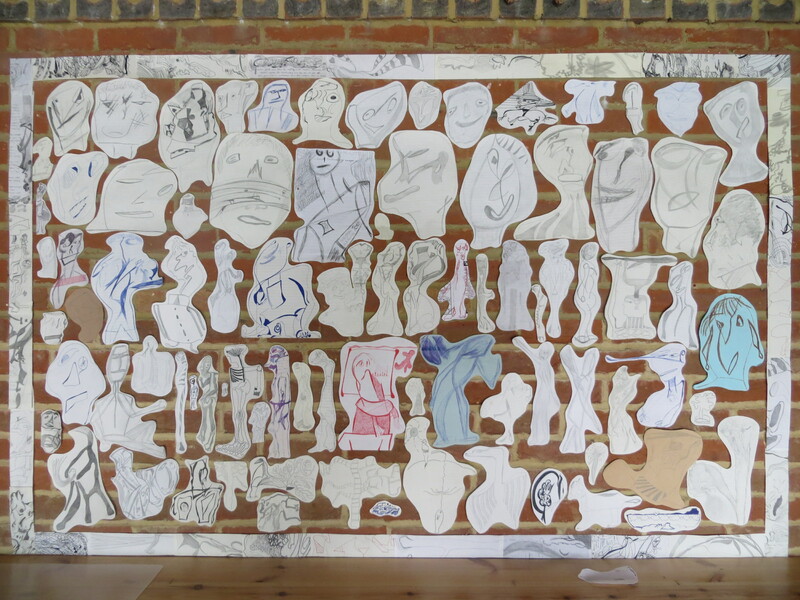 As I stuck the doodles on the wall I came to realise that this wasn’t going to look very much like a group photo and more like just a collection of things in a frame – a rather less interesting prospect that I envisaged. Apart from anything else, it was impossible to have the face only doodles appear as if their bodies were obscured by the people in front of them. The picture ended up being just rows of cut out doodles, one row on top of another. I was aware that what I was doing would appear rather weird to an onlooker – weird doodles being stuck onto a garage wall. This combination of a falling away of a general design and vision, and the growing awareness of weirdness, spurred me on to complete the job. I finished sticking on the figures and objects, cut out the frame and stuck that on, and then started to take some photos. Unfortunately it was windy, and when I opened the garage door one of the doodle pages got blown off. I hastily shut the garage doors, took a few photos with the flash, and decided to wait for a less windy day with a bit of sun. Such are the considerations which make artistic work a little more interesting and challenging! Luckily the following day (Sunday) was better and I managed to take some photos with the garage door open. Then it was a relatively quick job to remove the doodles and put them into the recycling ready for pickup on Monday morning. This was not the most interesting or rewarding of artistic ventures – but I still enjoyed doing it; and I’ve been thinking that, perhaps, sometime in the future, I could capitalise on what I’ve achieved by using ArtRage to capture the outline of the photo and to colour in the doodles. However for now my doodle travels – and scribbling travels generally – have ended. The DD (Doodle Destination not Double Diamond) is shown below. After taking a look at the first dozen or so items in my two scribble folders I realised this is not going to be like sorting out a load of old mementos which bring back some interesting memories. With the exception of the doodles, most of it is very personal stuff reflecting deep-felt, often troubled, emotions. Furthermore most of it is some 40 years old and I have no memory of some of the contents. It will certainly make me reflect. However, regardless of the contents there was still an initial Order from Chaos job to be done to get this pile of paper in order. I did an initial sort into rough piles, and then a more detailed sort based on a quick read-through of each item. This was a bit of an eye-opener. It was quite hard to read some of the stuff without squirming or feeling embarrassed about some of the things I had written or had done. However, this is the nature of looking back across our lives since there can be few of us who have not said or done things they perhaps wish they had done differently. Having that material written down gives it even greater impact. One thing this initial read-through made me realise is that in at least two instances my memory of 40 year old events was either completely wrong or missing large chunks of significant elements. I suspect this is not uncommon and is a possibility that is always worth bearing in mind when being told stories of long past events by other people. I’ve created a working document in which I’ve noted various ideas of what to do with each item, and this has made me realise that some of the material can simply be added to existing hardcopy and/or digital items in my mementos collection; and the remaining items will be new additions to the collection. Having an existing mementos collection with an established Index and approach to hardcopy and digital filing will certainly make the whole exercise much easier and quicker. So now I’ll start to work through the items in each category and deal with them accordingly.